An authentic Asian tapas bar and cocktail lounge is coming to the former Sovereign Southeast Asian Kitchen space in the heart of San Diego's Gaslamp. Monkey King is anticipated to open at 467 5th Avenue in early 2017. Sovereign Southeast Asian kitchen was supposed to be a Vietnamese food destination by Michelin-starred Chef Michael Bao Huynh, but it turned into one of San Diego's biggest culinary disappointments of 2015. Less than a year and a half after the debut of Sovereign, the prime space located on the same block as the incoming Pendry Hotel has a new tenants and is currently under construction for another Asian-fusion concept. Monkey King is the first endeavor by longtime Verant Group manager Matthew Nosse, who most recently managed nearby Barleymash. Slated for a January 2017 opening, San Diego’s Gaslamp will be home to a much needed, chill-minded, Asian-inspired restaurant and lounge. Its name, Monkey King, is dredged in our city’s fascinating Chinese Heritage - a reference to the once-upon-a-time "Monkey King" lottery house and gambling ring. 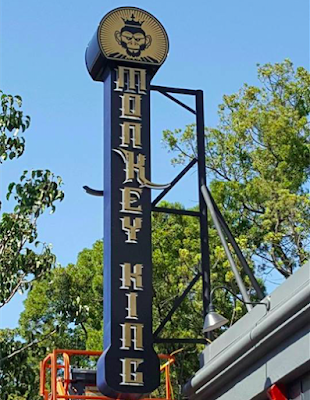 With an open patio, Monkey King will provide the ideal setting for guests who would like to go out and experience San Diego nightlife, but prefer to avoid the loud and hectic vibes of clubs and other bars. The bar will serve a concise menu of Asian-inspired tapas and dishes, craft beer and custom cocktails. Upon opening, their hours of operation will be from 11am to 2am. For more information on Monkey King, visit monkeykingsd.com.